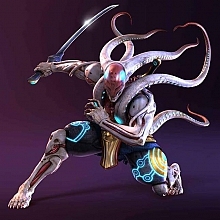 well, this topic is mainly about custom yoshimitsu comnbo's that aren't mentioned in the tekkenzaibatsu list or some other popular yoshimitsu combo thread with a list. In here we'll be posting custom-self made combo's. It doesn't matter if your combo doesn't do a lot of damage, or if it's against a wall. Anything goes! You're also allowed to call it the " Deguzzi Combo" or the "Aozame's burst combo"
It's also helpfull to give a little sub information if it's needed. Be creative and go combo crazy xD ^^!!! Listed based on the launchers, stages and other special notes. NSS ,u+3+4, d/f+2, 1, f+3+4, 1, ff+4_3~4 ~60 dmg. is U/F+3 the rising knee or the stun kick? # xXAngelBoyXx : is U/F+3 the rising knee or the stun kick? Aw man... Hahaha, I didn't see it on TZ, but yeah, it's the rising knee. I really have many combos on Yoshimitsu, but i cant use all yours (f,N,d,)-kinds of marks. My marks are like tiregly in the PS2-3, becose i have use to them. I still play now wits xbox, so i'll hope that these will fit even now. So, this combo start with Kangaroo Kick, then comes (what you call) U/F+4, then comes f+1+2, and then this legendary ~KIN f+2. I really have much combos in my pockets, but translation is hard. Is there any place to look those marks of your ofns? And if you want the MOST damaging juggle that yoshi can do, CH d+1 (wait for 7 hops),2, f+1+2 B! b+2,1~KIN f+2 190 dmg (full bar), but this is not something that could never really be used. I really put lot of harakiri to wall-combos. It really give power to tsohe combos! I think that harakiri is the best way to end simply wall-combos and there is no more stronger...? It is still an risk, but i'm always ready to take it. I use Harakiri to all combos, if there is a wall close. I'm almost sure that if you add one "blood petals" spin to that combo, the damage will be higher. Of course if you're on the left side of the screen (facing right), b+1 must be done as if Yoshi was still facing right. I'll check it out as I get back home, it was the case in Tekken DR, should be also in Tekken 6.
it is true. That can increase the dmg, but sorry it doesn't hit to enemy... If enemy may be higher it may hit him too. If i tell one combo what isn't so "self-evident". But there is over 30 ways to start a combo with Yoshimitsu! And each one already contains the best combo on earth. And isn't the strongest best? Is there any research the best combos of all these "combo-starter"? There is sure that what xXAngelBoyXx gived to me previously, but there really is not like 30 ways to start combo. No problem dude, I feel correcting and testing may be my only way of contributing to this thread. I'm not to keen on writing my own combo's, I don't have much for confidence in my own creative abilities. I'd rather take what other more skilled Yoshi players have done and add that to my game.